Shinobu draining the life out of your desktop. Desaturated the bg partially; the idea is a desktop wallpaper shattered into pieces. Browse Shinobu Oshino Gallery: Recent | Popular. saw this in AP and faved it there too. wow. i love the bright yellow/oranges with the greyscale! looks wicked. I think rather than draining the life out my desktop, this gal's being the life of it! awesome wallie! 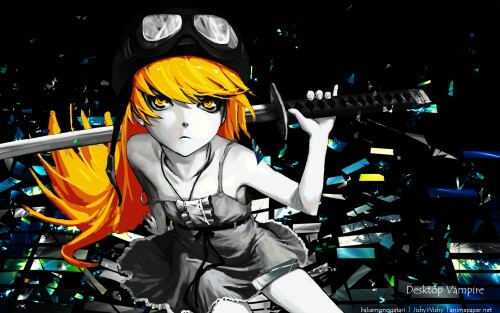 shinobu lolicon vampire is the BEST ! va.. va... va.... vampire! thanks for this! Very very very cool picture!